The leaves. Unfold the banana leaves and cut off the long, hard side of the leaf (where it was attached to the central vein). Look for holes or rips, then cut into 10 unbroken 12-inch segments. Either steam the segments for 20 minutes to make them soft and pliable, or one at a time slowly run them quickly over an open flame or hot electric burner until they are soft and glossy. Cut 10 long strips of leftover leaves to use for tying the tamales. The filling. Measure 3 cups water into a medium-size (2-quart) saucepan, add the onion and 1 sprig of the epazote and set over medium-high heat. When the liquid comes to a boil, add the chicken breast, lower the heat to medium, cover and simmer until just cooked through, 10 to15 minutes. Remove the chicken from its cooking liquid and set aside. Strain the liquid (discard the solids), skim off any fat that rises to the top, then measure 1 2/3 cups of it into a blender jar along with the achiote paste. Set the pan aside. If you have fresh masa, add 1/2 cup of it to the blender; for masa harina, add 1/2 cup plus 1/4 cup warm water. Blend until smooth, then strain through a medium-mesh strainer into the saucepan used for cooking the chicken. Whisk constantly over medium heat for several minutes as the rusty orange liquid comes to a simmer and thickens (it’ll be a little softer than a just-opened can of cream soup). Season with salt (about 1/2 teaspoon) and scrape into a small bowl to cool, stirring occasionally. Skin, bone and coarsely shred the chicken breast. Core the tomato and slice into 10 rounds. Pick 10 large leaves from the remaining 2 sprigs of epazote. The batter. If using masa harina, mix the remaining 1 3/4 cups with 1 cup plus 2 tablespoons hot tap water and let stand 10 minutes. Place half of the masa (reconstituted or fresh) into your blender, along with 2 cups of the broth. Blend until smooth, then strain through a medium-mesh strainer into a large saucepan. Repeat with the remaining masa and broth. Set over medium, add the lard (or vegetable shortening), then whisk constantly for several minutes as the mixture comes to a boil and thickens enough to hold its shape well in a spoon. Remove from the heat, taste and season with salt, usually 1 teaspoon. Cool completely, stirring occasionally. Form and steam the tamales. One at a time, form the tamales: Using a spatula, spread out a level 1/2 cup of the masa batter over the center of 1 banana-leaf segment into a 4 x 8-inch rectangle. Over one half of the masa rectangle put 2 tablespoons of the chicken, 1 slice of tomato, 1 leaf of epazote and 2 tablespoons of the achiote-flavored sauce. Using the leaf, fold the uncovered part of the masa over the covered part, completely enclosing the filling. 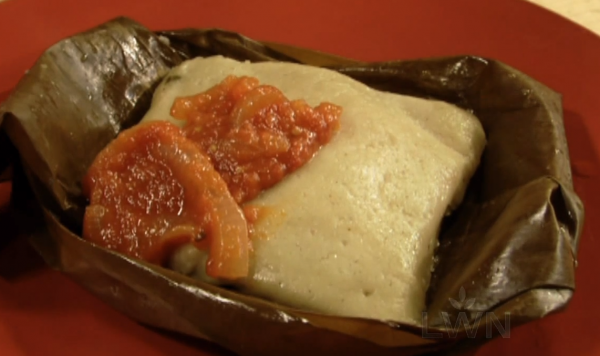 Fold in all sides of the banana leaf even with the enclosed masa and tie the tamal with one of the banana leaf strips to hold all the folds in place. Continue spreading, filling and folding until all 10 tamales are made. Set up a large steamer (a Mexican tamal steamer or Chinese steamer will give you the greatest surface over which to distribute the tamales) with a couple of inches of water and spread half of the remaining banana leaf scraps over the bottom of the steamer tray. Arrange the tamales in the steamer folded-side down, stacking when necessary, but not more than two high. Cover with the remaining banana-leaf scraps. Bring the water to a boil, cover tightly and steam over medium heat for about 1 hour (tamales made from reconstituted masa may take a little longer). Remove a tamal, open it and test to see if the leaf pulls away - the sign it is done. Watch carefully that all the water does not boil away and, to keep the steam steady, pour boiling water into the pot when more is necessary. These tamales will be quite soft when done; it is best to let them cool completely to firm up, then reheat in the steamer (10 to 15 minutes) to serve. They may be made 2 or 3 days ahead and refrigerated, tightly wrapped. To give your tamales a nice presentation, untie them, fold back the leaves, tucking them under to form a little boat, spoon some salsa over the top and they’re ready to go. Using a Instant pot or a crock pot to stream tamales isn’t bad idea. Have you tried them on? I think i’ts better if you use them. However, thank for writing a good instructions. I’ve never heard of this type of food. It seems very tasty. I’ll try it at home! Thanks for sharing! One of my ABSOLUTE Favorites! Melts in your mouth delicious!